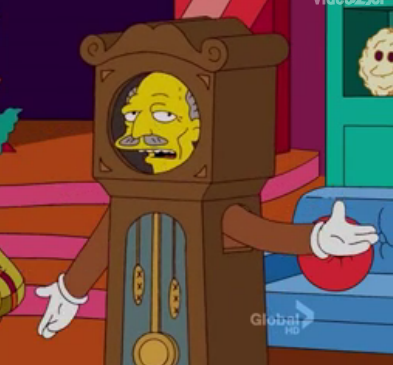 Tick-Tock the Clock is a character from The Krusty the Clown Show Retro Reboot! Krusty welcomes him back on stage where he says a poem about not wanting to play this career killing role and that he wanted to turn back the clock so he could stop himself from doing it. Krusty then interprets this as meaning that they should play "What's in Krusty's Pocket?" Modified on September 10, 2012, at 17:36.